Posted on May.10, 2014 by Barry Bookmark the Permalink. 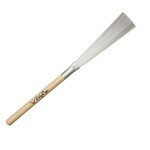 Regal Tip's Classic brush is the world's best selling brush for drummers. 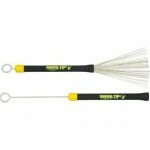 This retractable wire brush has a durable gum rubber grip and a patented adjustable spread. The metal rings on the handles can be used for additional sound effects. 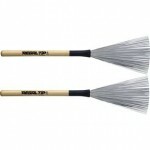 Retracting the brushes when not in use prevents them from becoming bent or damaged. 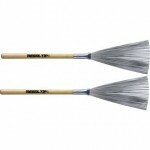 The Regal Tip "Classic" brush sets the standards for all drum brushes. Regal Tip Ultra-Flex Nylon Brush is a fixed nylon brush that has a long American hickory wood handle and Regal Tip finish. 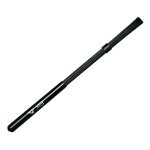 The Ultra-flex excels in a range of low-volume styles and is perfect for jazz and acoustic music. 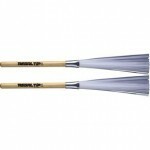 Regal Tip has been supplying great drummers with great products for 50 years. As the global leader in brush manufacturing, Regal Tip set the standard for what you have come to expect. All Regal Tip products are hand-crafted with detailed precision. 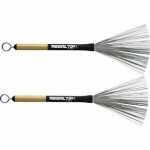 The non-retractable Poly bristles produce a warm, mellow sound on both drums & cymbals. 5A sized wooden handle. Versatility of a drumstick and a brush all in one. Drumstick end has a 5A tip. Non-retractable. The Regal Tip "Fat Cat" Brush is a fixed spread nylon brush that will give you a fuller, fatter sound. 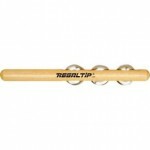 The soft rubber handle has a thick, comfortable grip and a molded ball-shaped end for cymbal rolls. Regal Tip has been supplying great drummers with great products for 50 years. As the global leader in brush manufacturing, Regal Tip set the standard for what you have come to expect. All Regal Tip products are hand-crafted with detailed precision. 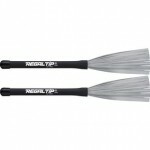 Regal Tip Aluminum Handle Brushes have a patented adjustable spread and retractable wire bristles. These cymbal or drum brushes will give players light, fast, and responsive action. Dimensions are 13.5" length and .437" diameter. 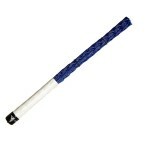 Regal Tip has been supplying great drummers with great products for 50 years. As the global leader in brush manufacturing, Regal Tip set the standard for what you have come to expect. All Regal Tip products are hand-crafted with detailed precision. 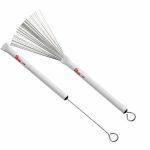 Use it like a brush, rute or stick --- the Vater Whip consists of polybristles that pack more punch than a brush but without the volume of a drumstick. 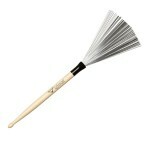 Vic Firth Legacy Brushes are retractable wire brushes with a wood handle that provides a natural feel in the hand. Made with medium gauge wire and an infinitely adjustable brush spread capable of maintaining any playing position. 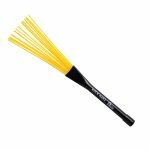 Diameter=.530" Spread=5"
The Regal Tip Yellow Jacket Rectractable Brush is a first quality telescopic percussion brush with an economic price tag. 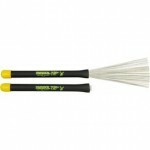 The wide spread brush wires store inside the comfortable grip rubber handle for protection. 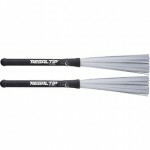 Regal Tip has been supplying great drummers with great products for 50 years. As the global leader in brush manufacturing, Regal Tip set the standard for what you have come to expect. All Regal Tip products are hand-crafted with detailed precision. 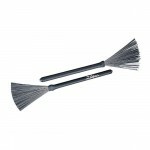 Rubber gripped wire brush that is retractable without a pull-rod. 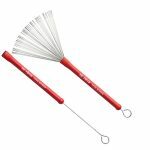 Non-retractable wire bristled brush with a soft rubber grip. Also features metal rivet. The Vater Monster Wood Brush features the same nylon bristles as in the Vater Monster Brush and Vater Little Monster, just placed in a traditional brush arrangement. 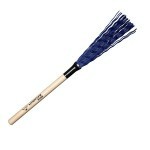 The bristles give a funky and textured "swish" sound and great backbeat accents. The wood handle grip is a 5A sized diameter. 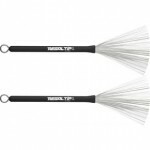 A rubber handled retractable brush with heavy gauge wire for a full sound. 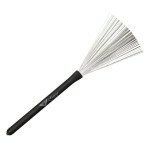 The Vater Heavy Wire Brush provides a bit more weight and volume than a traditional wire brush. 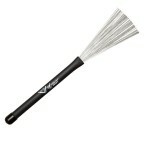 The Vater Wire Tap Poly Brush features nylon bristles for flexibility and a sweet slap on drums. Retractable without a pull-rod. A smaller diameter version of the original Vater Monster Brush for a lighter feel and weight. 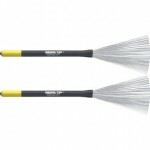 A classic retractable wire brush. Sturdy pull-rod with round metal end for cymbal scrapes. Wide range of brush spread adjustment. 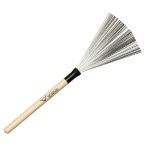 The Vater Cajón Brush is a great sounding brush/stick element for use on Cajón drums and world drumming instruments. Made of wavy polymer strands for a great sound. Switch between hands and the Cajon Brush for varying colors. 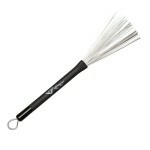 Vic Firth Dreadlocks feature braided heavy gauge stainless-steel wires to produce bold percussive sounds. Strike‚ scrape or let your imagination create a variety of effects. With hickory handles. 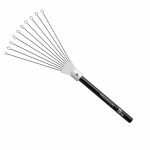 Length=14″ Diameter=.575″ Spread=5 1/2"
The Vic Firth Jazz Rake features retractable thin‚ flexible bristles for fusion and jazz. 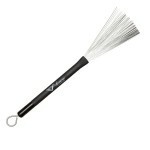 Diameter=.605" Spread=4"
Vic Firth Heritage Brushes feature a light gauge wire and a smooth rubber handle. Fast and easy to play. An "old school" favorite. Diameter=.530" Spread=5"
Vic Firth Jazz Brushes are retractable wire brushes with an infinitely adjustable brush spread capable of maintaining any playing position. A 5″ spread and extra heavy gauge wire provide maximum coverage and sound. Diameter=.575" Spread=5"